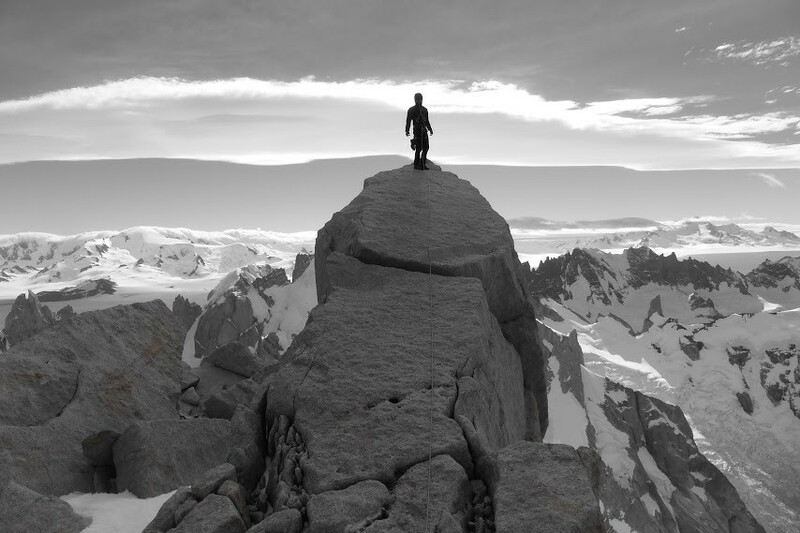 The Summit of Mermoz, Patagonia, photo by Vitaliy Musiyenko. 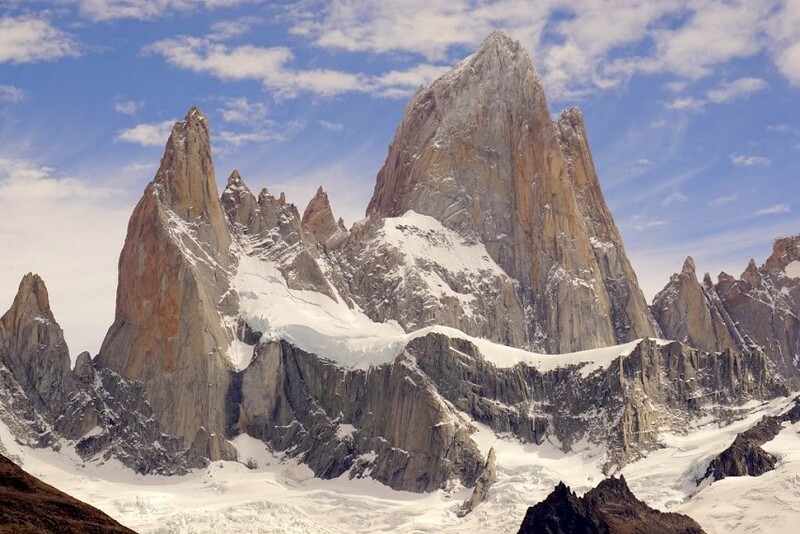 No matter if you are into hiking, bouldering, climbing, giant alpine walls, or capturing incredible scenery with your camera, the Chaltén Massif area in Southern Patagonia, Argentina, is a place every outdoor enthusiast must visit. If asked to share one essential pointer with those who aspire to see the area for themselves, it would be to BOOK THE TICKET! There are plenty of reasons to put the trip off: Lack of skills to send the Fitz Traverse, fear of getting pinned in town by the unstable weather, lack of funds, absence of the perfect partner, less time off work than desired. Some are very valid concerns. Having said that, I found most reasons not to go to be born of exaggerations, false assumptions, and fear of the unknown. 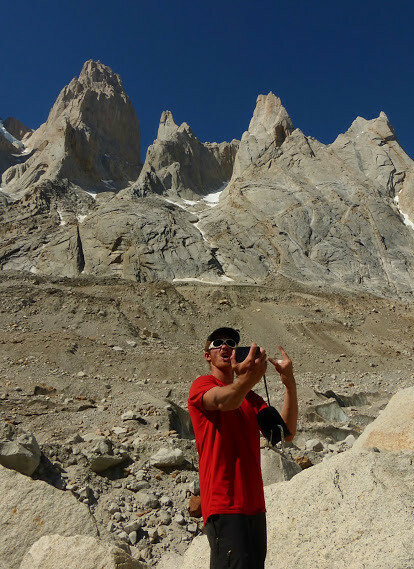 In the article, I will do my best to share my experience staying in the town of Chalten, organizing logistics, and sampling some of the climbing in the area. This article is written to encourage members of the Planet Granite community to explore Patagonia, so I will do my best to share plenty of wisdom. The Fitz Roy Massif, Patagonia, photo by Vitaliy Musiyenko. Let’s start with basic history and geography! Chaltén is a small town in southwest Argentina. It is so close to the border with Chile that climbers must get a Chilean visa to use some of the trails into the mountains. The territory was disputed by the two nations and Argentina ultimately got to keep it. The town was named after the most prominent peak in the area – Mt. Chaltén, or Fitz Roy, as most know it. Chaltén means the “smoking mountain,” and during my stay I quickly understood why. Most days I was able to see Mt. Chaltén from town, and the clouds formed a circle around the peak’s base or swept over the summit. The Fitz Roy Massif is a symbol displayed on most of the businesses around town. Globally, it’s recognized as the symbol of Patagonia, the brand, which was founded by Yvon Chouinard. Chouinard made numerous difficult first ascents in Yosemite, along with impressive feats in the greater ranges as a climber. He also made significant advances in climbing equipment, which led to manufacturing climbing gear and clothing for the masses. 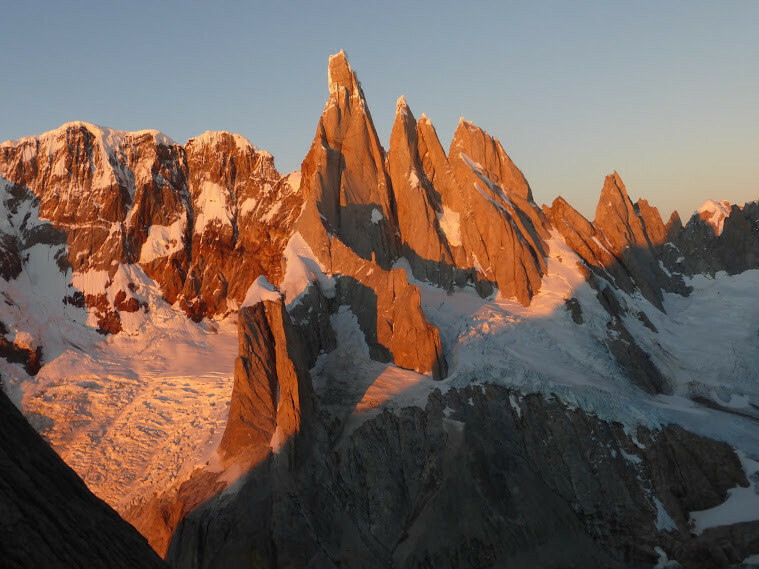 Chouinard picked the outline of Fitz Roy massif as the symbol for the brand after climbing a new route on the mountain in 1968. Back then, it was only the third ascent of the peak. The area has changed a lot since the days of early exploration. In the late 1960s and even in the early 1990s, Chaltén was not what it is today. In the present, the area has a variety of upscale hotels, expensive restaurants, a disco, la chocolateria, gear outfitters, authentic souvenir stores and an organic grocery shop. For visitors on a budget, cheap food, hostels and even a campground options are available. Personally, I paid $200 for a month-long lease of a shared room with a communal shower and a kitchen. One could stay there for a year while renting out a place in the Bay Area and make a significant profit! The original explorers came for a few months and camped on the glacier, with no way of knowing when the favorable weather would arrive. Frequent false-starts kept them fit, in contrast to modern climbers, who load up on crispy empanadas in the morning, enjoy world-class bouldering during the day, then pass around a wine bottle in the evening while pretending to be weather-experts as they analyze the meteograms. The experience of climbing in the range is not the suffer-fest it once was. Although the comforts of town make the experience more varied than it used to be, some things don’t change: The mountains are still fierce. Even with hundreds of new routes to the top and established rappel routes to get down from the summits, the mountains remain dangerous. With the number of climbers ever increasing, the number of deaths and accidents have increased as well. A variety of causes contribute to the tallies of accidents and deaths. They range from mistakes under pressure, or due to inexperience, to unexpected storms, to crevasse falls, or loose rock and simply being in the wrong place at the wrong time. The photos of the peaks are beautiful, but don’t let the looks deceive you into letting your guard down. While big and proud, Fitz Roy is not the peak most would consider to be the most striking in the area. I’ve been lucky enough to climb in multiple ranges around the world with striking peaks, including an ascent of Alpamayo (19,511’) in Peru, which some consider it to be the most beautiful peak in the world. In my opinion, however, neither Alpamayo, nor anything else I have seen can come close to the view of the Cerro Torre illuminated by the early morning alpenglow. A perfect rock spire capped by an ice mushroom, the mountain rises thousands of feet above the glaciers that surround it. Multiple books and narratives have been written about its disputed first ascent. Recently, a new wave of drama in recent years followed the “fair-means” ascent of the Compressor Route, which ended with some of the original Maestri Bolts getting taken out…but that’s a whole other story. 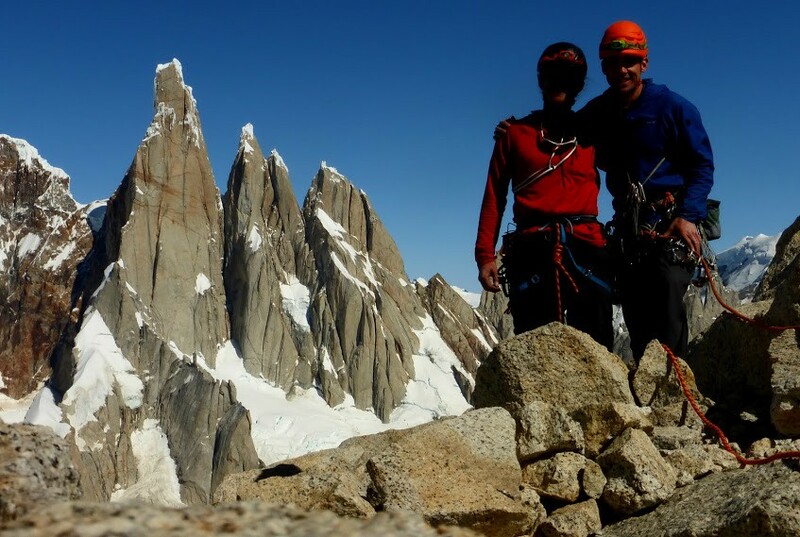 While Fitz Roy is the biggest, and Cerro Torre the most striking, it is likely Torre Egger that is most difficult to summit by the easiest available route. No matter which peak you choose to attempt out of the many attractive options, every one of them requires a certain level of competence, and allows for unique views towards other magnificent mountains. Cerro Torre from St. Expury, Patagonia, photo by Vitaliy Musiyenko. My trip to El Chaltén did not start the way I thought it would. Namely, I was forced into a desperate search for a partner just a few days prior to my arrival. As I dropped off my bags at the San Francisco airport, I got news of a three-day weather window rolling in. Instead of waiting weeks for my original partner and another weather window while enduring sleepless nights due to hurricane-like winds, I decided to jump at the opportunity of the good weather. Some last-minute searching led me to a random guy I met at the base of the “Incredible Hulk” last summer. His name was Bud Miller, and even before we met, I had a good feeling we would get along. After some brief internet communication, we picked “Chiaro Di Luna” as our objective. 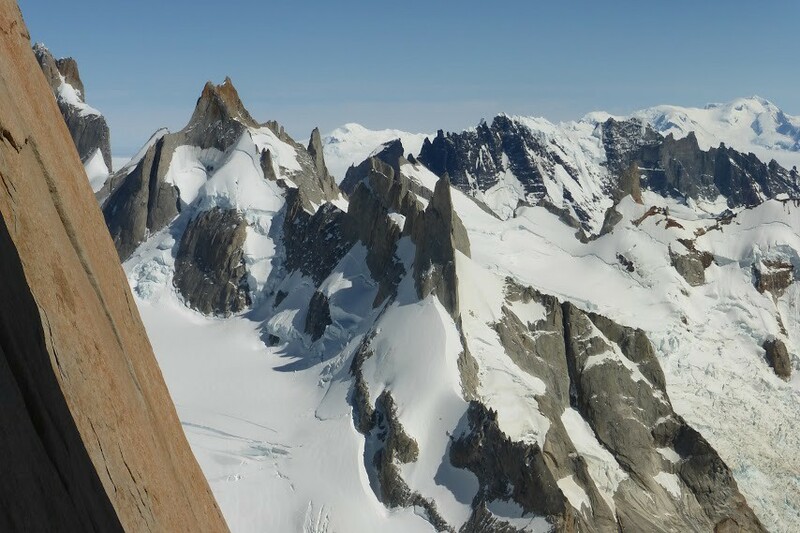 The grade V 5.11a ascends “Aguja Saint Exupery,” an elegant spire with incredible views of the Cerro Torre Massif. After 33 hours of flight time and another five hours by bus, I was finally dropped off in Chalten. Even though I was exhausted from two days of sleepless travel, before I even found my hostel, I went over to Bud’s and we prepared our gear. With a few hours of sleep we hit the trail, which began only two blocks up from my hostel. My exhaustion from travel melted away and was completely replaced by excitement. When we first saw the scenery Laguna Torre has to offer, we took a break, during which I snapped dozens of photos. The views only got better as we made our way towards the Niponino camp, which is situated between the Fitz Roy and the Cerro Torre Massif. 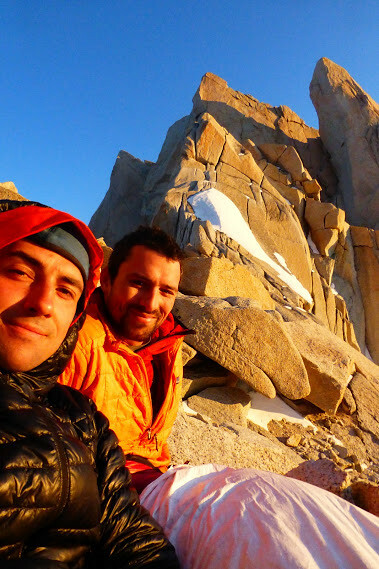 “Chiaro Di Luna” is considered as one of the best alpine rock climbs in the range. In California terms, it’s either “Positive Vibrations” and “The Red Dihedral” on the Hulk stacked on top of each other, or it’s like a longer version of the Northwest face of Half Dome. It is not a cutting-edge climb; it was even free-soloed while I was visiting. But it being the first time my new partner Bud and I climbed together and the first trip to the range for both of us, and we were a little intimidated by the big objective. 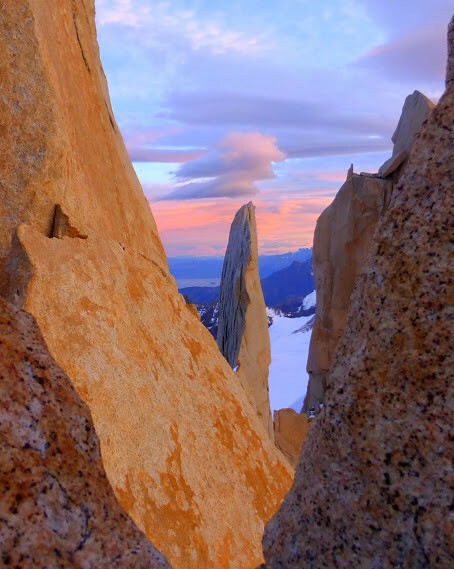 Bud Miller and the Spire of St. Exupery, Patagonia, photo by Vitaliy Musiyenko. To be honest, it is hard to not feel overwhelmed while hiking up the giant glacier, surrounded by walls that are much more impressive and rugged than the El Capitan! Unlike Yosemite, there is no organized Search and Rescue available. If you need help, it can only be organized by other climbers, and only if they want to volunteer. Each party is ultimately responsible for their own safety. Coincidentally, Bud was an active member of the Yosemite’s Search and Rescue, so I felt much more secure climbing with him than I would with any other stranger. We got along well and made good time climbing the route in blocks. Bud and Vitaliy taking a rest stop midway up St. Exupery, Patagonia, photo by Vitaliy Musiyenko. The most memorable spot for me during the ascent was when instead of the easy, but time-consuming aid climbing, I decided to run out a 30-foot 5.10a layback near the summit. The route finding was not too difficult, but before we found the summit proper we had to negotiate a section of powder-snow-covered slab. It turned into a harder section of ice and led to a wide boulder-y-like crack, which we did not have large enough gear to protect. 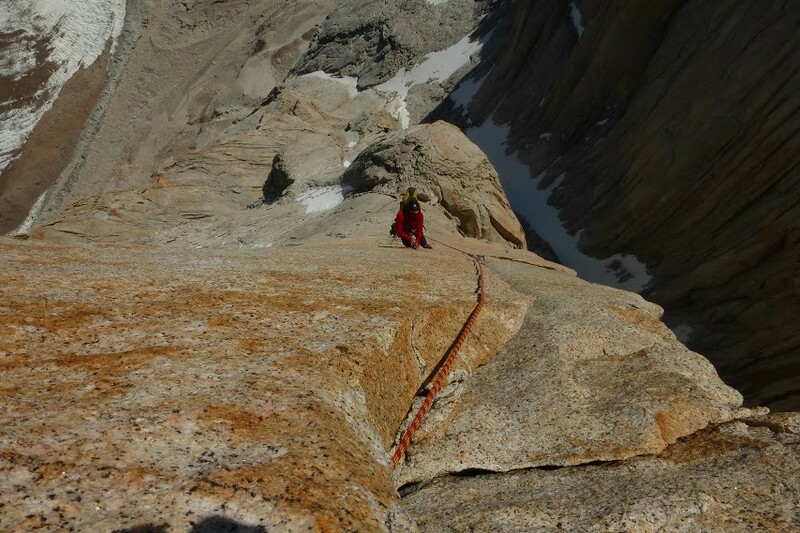 The way to the summit proper is not well-described in the outline, and most climbers opt to rappel the route without topping out. To me personally, summits matter, and eventually, after navigating the tough terrain, we snapped photos with majestic views from the pointy top. In my opinion, once you have the skills and the weather, the crux of climbing any of the longer routes in the range is the route finding, efficiency and endurance. The guidebook for the area, although awesome, is much too general for someone used to the Supertopo format. I have nothing against the Supertopo guidebook, have several myself, and consider it to be the best of the select options, but an aspiring Patagonia climber should be ready to find thousand-foot sections summarized in a sentence, or a general outline, not a pitch-by-pitch breakdown. Bud Miller high up on “Chiaro Di Luna,” Patagonia, photo by photo by Vitaliy Musiyenko. To prepare, I would suggest you practice climbing using only general topos, such as those found in the Yosemite Valley Reid’s Guide. Climbs like the Middle Cathedral’s “Ho Chi Minh Trail” or the “North Buttress” (not to be confused with DNB), or the “Windfall to Windchill” link-up a little further west, would be excellent options to practice route-finding. Longer routes in the Sierra or a trip to the Bugaboos could be a great way to work on the skills, efficiency, and to gain the confidence required for a committing route in Patagonia. Big wall climbing can help one to deal with exposure, commitment, and to get efficient with the rope management. Ice climbing and general mountaineering will prepare you to deal with crevasse rescue, confident soloing of moderate snow slopes, and leading sections of steep ice. Plus, big wall climbing and ice climbing are fun and teach one a different way of ascending a mountain! Bud enjoying the clean granite on “Chiaro Di Luna,” Patagonia, photo by Vitaliy Musiyenko. Unfortunately for me, during the hike back, I hurt my heel, which limited my aspirations. While waiting for the next weather window, I could only boulder a few times, as putting the climbing shoes on was a painful experience. So instead I occupied my days with eating ice cream, reading, doing pull-ups, and surfing the web in a coffee shop. The sight of the early morning sun hitting the Fitz Roy never got boring to photograph, so a lot of my time was spent taking and editing photos. In the evenings, I was still able to play the weather expert, but as a newbie to the range, I didn’t have much credibility. Generally, I learned there is always a forecast for good weather a week away and one should not let even a day-long window pass in hopes to take advantage of a later window that looks better. Unless a major high pressure system is starting within 24 hours of the new meteogram, take each forecast with a grain of salt. This valuable information was shared by some of the veterans of the range and led to a second successful trip into the hills. 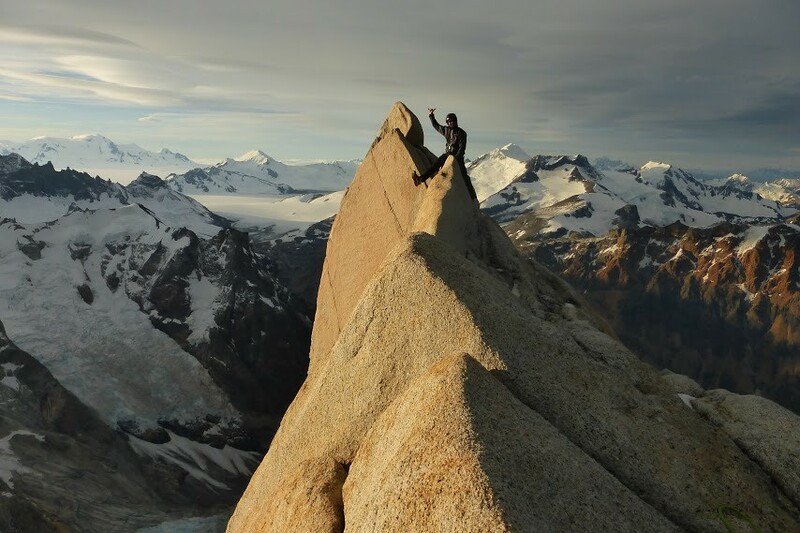 Richard Shore enjoying the scenic summit ridge of Guilliamet, Patagonia, photo by Vitaliy Musiyenko. A week after climbing “Chiaro Di Luna,” we got another day-long window to attempt an ascent. By then, my original partner Richard Shore had joined us, so we decided to do the “Motorcross Traverse,” which climbs Aguja Guillaumet and Mermoz. The first two of the seven peaks were first traversed by Tommy Caldwell and Alex Honnold in 2014. The recent Reel Rock movie captured their climb, the town and the surrounding scenery really well. Guillaumet’s popular routes that ascend the mountain aren’t long or difficult, so we made breakfast in the hostel, grabbed a cab, got to the trail-head after 10 a.m., hiked in, climbed, summitted and found a bivy spot near the top, all prior to losing the valuable daylight. In retrospect, I would wake up earlier than 7am, if I had an option of doing it again. I didn’t know it prior to the trip, but since none of the peaks in the range are high in altitude, town-to-town ascents are not only possible, but do-able for mortals. To climb the first of the two peaks, we chose the Brenner-Moschioni route with about a thousand feet of rock climbing with difficulties up to 5.10c. The route follows moderate snow and ice slopes to an incredibly exposed spire-like summit. Richard and I were in rhythm and covered the terrain quickly. Views toward the glacier from the Motorcross Traverse, Patagonia, photo by Vitaliy Musiyenko. To prepare for the trip, in January of 2015, we climbed multiple routes in the Yosemite Valley together, including the four-pitch WI 5 ice climb “The Silver Strand,” which forms fairly rarely and fell apart a few days after our ascent. Luckily a week later the weather was good enough for us to climb the Nose on El Capitan in much less than a day. Knowing your partner and being ‘on the same page’ is very important when it comes to long climbs where taking less time doing small tasks could mean saving hours in the long run. Generally, the ice climbs in Patagonia tend to be in better shape in November and through the early January, earlier in the season. 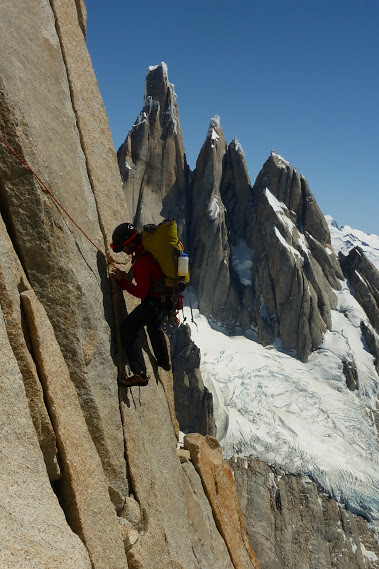 The Ragni route on Cerro Torre is one of those few exceptions, which is usually doable during any weather window that is long enough. The climbing is usually better during the later season; January and February, although the seasonal conditions depend on a variety of things and can change course in a matter of a few hours. Sunset, Patagonia, photo by Vitaliy Musiyenko. The day after climbing Guillaumet, we followed the “Argentina” (900 m, 5.10b) route to the proper summit of a peak named Mermoz. The route crossed around intimidating pillars, climbed over steep spires, and traversed exposed snow slopes. While enjoying the view of the Chilean ice cap, along with the shadows of the Fitz Roy Massif and a unique view of the Cerro Torre, we realized the wind was picking up and our weather window was coming to an end. As we rappelled 2,000 feet to the glacier, the winds pounded our bodies and flung the ends of our ropes into the void above. As we dealt with a stuck rope and getting over the giant bergshrund at the base of the wall, darkness crept in. We were tired and decided it would be safer to deal with crossing the glacier in daylight. At that point, all I had was a single energy bar and a teabag, which served as dinner that night and as breakfast the next morning before the lengthy hike out. Despite the winds, snow flurries, and limited comfort of a two-person bivy sack, we slept like babies. Having the light gear and bringing only the essentials allowed us to have much less than twenty pounds in our packs while climbing on the traverse. Packing light allowed us to move quickly over moderate terrain as we were less tired and enjoying the technical climbing without being slowed down by the heavy loads. Richard and Vitaliy in their bivy, Patagonia, photo by Vitaliy Musiyenko. While climbing peaks was what originally brought me to Patagonia, the trip allowed me to make new friends, sample local cuisine and experience the local culture. I was delighted to boulder around town at my leisure on the days my foot allowed it, and to my surprise, the most pleasant experience I had in the mountains was a solo backpacking trip to Laguna De Los Tres. Before that outing, I was annoyed by my injury, which forced me to book a flight out only 18 days into a trip that was supposed to last a whole month. The solo backpacking gave me time alone, and helped me to remember that being flexible and having low expectations is an essential part of mountain climbing. Summiting a particular peak by a particular route shouldn’t be expected, since the conditions in the ranges, along with conditions of personal health, can change in an instant. Finally, I had the relaxed atmosphere with plenty of time to reflect on my grand adventure. Seeing large groups of friends enjoying the day reminded me of how much I missed hanging out with my own family, friends and even co-workers! The shorter stay in which I climbed way more than I expected, no longer seemed like a negative outcome. Compared to the rushed experience of climbing rugged mountains, the simple overnight trip allowed me to stop and take in the views for as long as I wanted. Weight was no longer a concern, so I brought along my heavier camera, which allowed me to capture the jaw-dropping landscape along with its inhabitants. The much-appreciated psychological cleanse let my mind wonder towards excitement for the future. As I gazed towards the outline of the Fitz Roy’s Goretta Pillar and the magnificent wall of Poincenot, the possibilities seemed overwhelming. 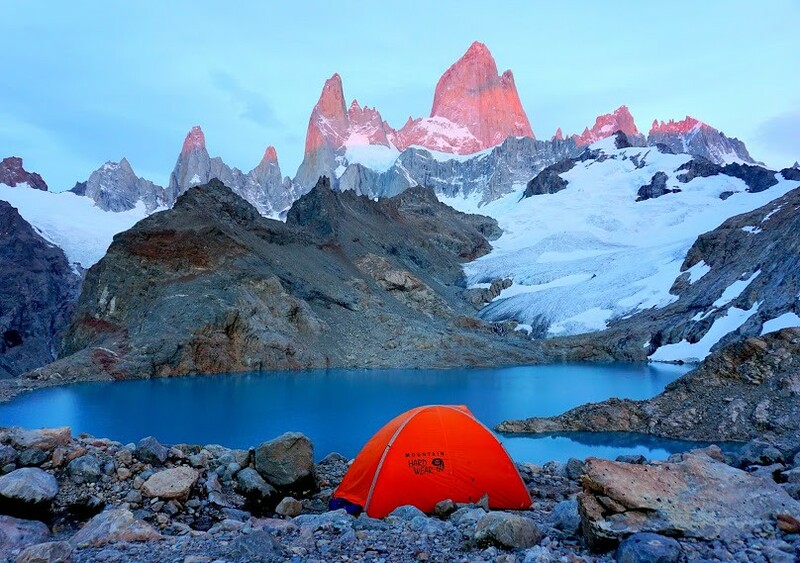 An incredible campsite at Laguna de los Tres, Patagonia, photo by Vitaliy Musiyenko. Writing this piece brought back pleasant memories, so I’d like to thank my new friend Reinhard for encouraging me to tell my story for the members of PG. My hope is that sharing the experience will inspire readers to embark on their own adventures to Patagonia, towards the local mountains of the Sierra Nevada, or any other place one may want to visit. No matter which mountain range, hike, climb, peak or a boulder problem makes you excited, it is important to remember Lao Tzu’s famous quote – “the journey of a thousand miles begins with a single step.” In case of us climbers, the journey could begin after hearing a story or seeing a photo. Hopefully my scheme to plant the seed of adventure will work! Rock climbing is dangerous and there is inherent risk in all forms of this sport. The comments in this blog do not necessarily represent the thoughts or ideas of Planet Granite. The information provided is one person’s opinion of how this climbing trip worked for them; treat it as such. The information provided may contain mistakes therefore we do not guarantee the accuracy of the information provided; it may be incorrect or misleading. This is not a substitute for a professional climbing instructor or mountaineering guide. This is not an instructional post; do not use it as one. If you have any doubts about your ability to make this trip or try these climbs, do not try it. You must use your own judgment when choosing, approaching, climbing or descending from any route, and please seek a professional guide for instruction or information. About the Author: Vitaliy started to hike up peaks of Tahoe area in early 2010. He quickly realized the difficult routes of ascent would require technical skills. That year, he joined the gym and used it in combination with mileage over varied terrain outdoors as a way to prepare for the next adventure. A few of his climbing highlights include onsighting the nine-peak “Evolution Traverse” in 27 hours car-to-car, summiting Mt. Denali, more than 30 First Ascents in the High Sierra, sending the Rostrum/Astroman and a recent first free solo of arguably the longest and the most iconic ice climb in the lower 48 states – The Widow’s Tears (V WI5).